Everyone who works with children and young people has a responsibility for keeping them safe. No single practitioner can have a full picture of a child’s needs and circumstances and, if children and families are to receive the right help at the right time, everyone who comes into contact with them has a role to play in identifying concerns, sharing information and taking prompt action. Effective sharing of information between practitioners and local organisations and agencies is essential for early identification of need, assessment and service provision to keep children safe. Serious case reviews (SCRs) have highlighted that missed opportunities to record, understand the significance of and share information in a timely manner can have severe consequences for the safety and welfare of children. Fears about sharing information must not be allowed to stand in the way of the need to promote the welfare, and protect the safety, of children, which must always be the paramount concern. No – the Data Protection Act 2018 and GDPR do not prohibit the collection and sharing of personal information, but rather provide a framework to ensure that personal information is shared appropriately. In particular, the Data Protection Act 2018 balances the rights of the information subject (the individual whom the information is about) and the possible need to share information about them. Never assume sharing is prohibited – it is essential to consider this balance in every case. You should always keep a record of what you have shared. No – you do not necessarily need consent to share personal information. Wherever possible, you should seek consent and be open and honest with the individual from the outset as to why, what, how and with whom, their information will be shared. You should seek consent where an individual may not expect their information to be passed on. When you gain consent to share information, it must be explicit, and freely given. There may be some circumstances where it is not appropriate to seek consent, either because the individual cannot give consent, it is not reasonable to obtain consent, or because to gain consent would put a child or young person’s safety or wellbeing at risk. Where a decision to share information without consent is made, a record of what has been shared should be kept. No – this is not the case, unless the information is to be used for a purpose incompatible with the purpose for which it was originally collected. In the case of children in need, or children at risk of significant harm, it is difficult to foresee circumstances where information law would be a barrier to sharing personal information with other practitioners. No – this is not the case. In addition to the Data Protection Act 2018 and GDPR, practitioners need to balance the common law duty of confidence, and the rights within the Human Rights Act 1998 against the effect on children or individuals at risk, if they do not share the information. If information collection and sharing is to take place with the consent of the individuals involved, providing they are clearly informed about the purpose of the sharing, there should be no breach of confidentiality or breach of the Human Rights Act 1998. If the information is confidential, and the consent of the information subject is not gained, then practitioner need to decide whether there are grounds to share the information without consent. This can be because it is overwhelmingly in the information subject’s interested for this information to be disclosed. It is also possible that a public interest would justify disclosure of the information (or that sharing is required by a court order, other legal obligation or statutory exemption). In the context of safeguarding a child or young person, where the child’s welfare is paramount, it is possible that the common law duty of confidence can be over overcome. Practitioners must consider this on a case-by-case basis. As is the case for all information processing, initial thought needs to be given as to whether the objective can be achieved by limiting the amount of information shared – does all of the personal information need to be shared to achieve the objective? 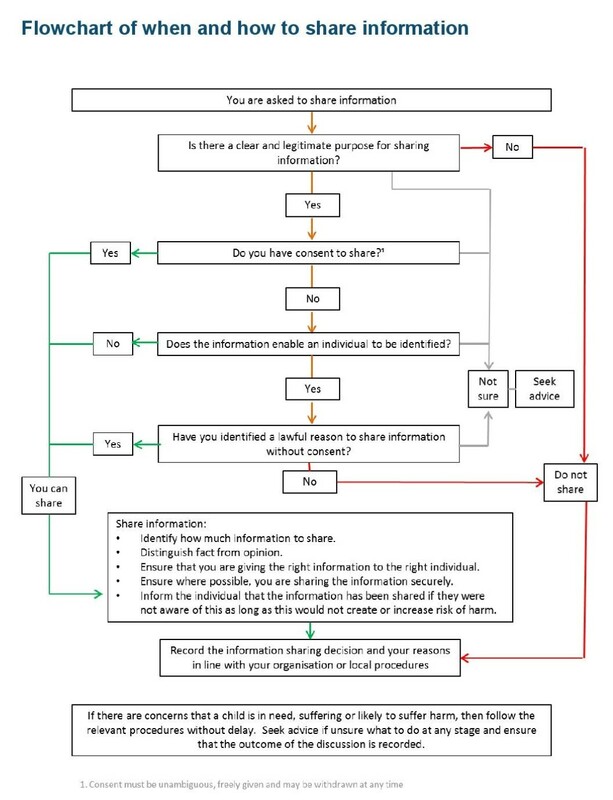 When asked to share information, you should consider the following questions to help you decide if, and when, to share. If the decision is taken to share, you should consider how best to effectively share the information. A flowchart follows the text. Q1. Is there a clear and legitimate purpose for sharing information? Q2. Do you have consent to share? Q3. Does the information enable an individual to be identified? Q4. Have you identified a lawful reason to share information without consent? Where possible, be transparent with the individual, informing them that that the information has been shared, as long as doing so does not create or increase the risk of harm to the individual. All information sharing decisions and reasons must be recorded in line with your organisation or local procedures. If at any stage you are unsure about how or when to share information, you should seek advice on this. You should also ensure that the outcome of the discussion is recorded.